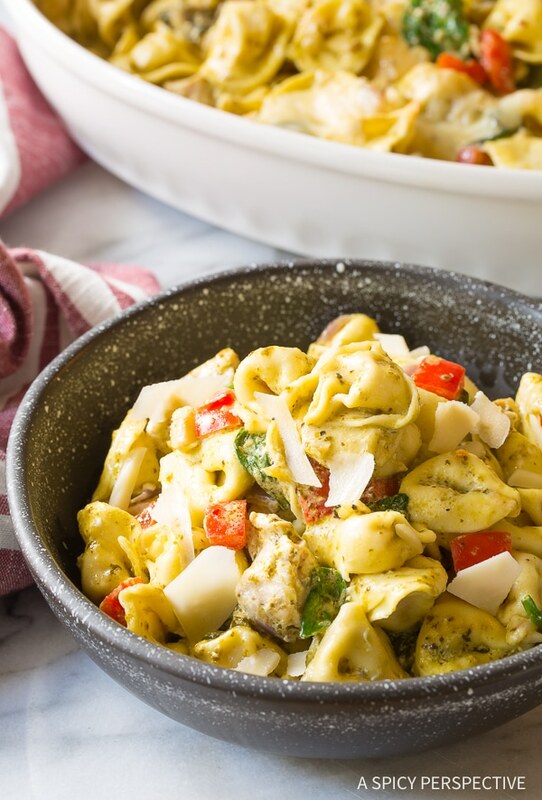 This cheesy Pesto Chicken Baked Tortellini, is easy to make and feeds a crowd! Last week a friend asked me if it was too late in the year to cook pasta. “What do you mean?” I questioned her. If you’ve ever wondered about serving pasta in the summer, let me reassure you, pasta is a forever-food. You may stop eating pumpkin baked goods after fall. Or you may choose to skip simmering soups in the summertime, but there’s never a wrong time to enjoy pasta. Pasta is delicious in every season, served cold or hot, with just about any combination of ingredients. In fact, even if you are a questionable cook, I bet you can make a decent pasta dish. Have you noticed, as long as you don’t cook your noodles to mush, or over-salt the pasta, it usually turns out? Well today’s recipe is not just a decent past dish; it’s amazing. And it’s not just for fall and winter; it’s a recipe for every season. 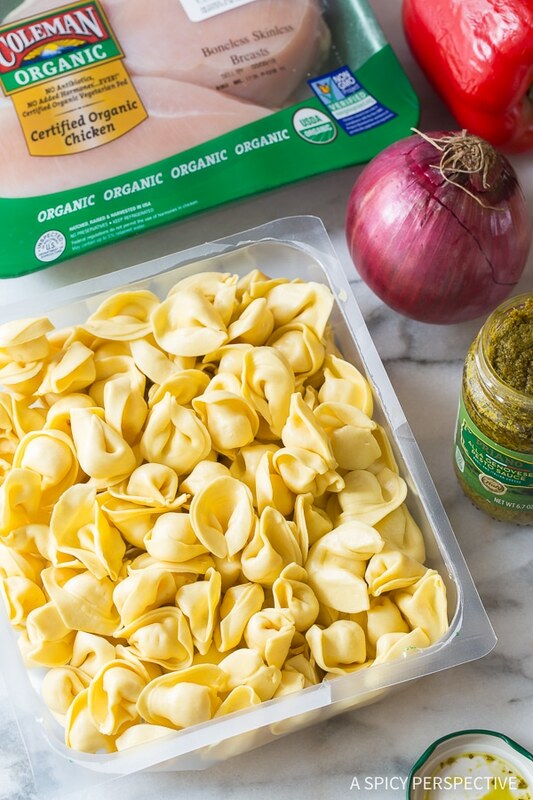 This Pesto Chicken Baked Tortellini pasta is made with refrigerated (or frozen) cheese tortellini mixed with chicken breast, fresh baby spinach, bell peppers, onions, cheese, and a creamy pesto sauce. The chicken is baked right along with the pasta! 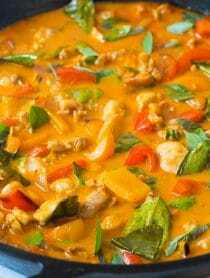 Whisk fresh-made or jarred pesto with cream and chicken broth into a thin baking sauce. Once poured over the pasta, the sauce thickens as the pasta absorbs the moisture as it bakes. 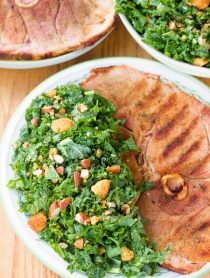 You can add all the ingredients to the baking dish raw, for a true one-pan dinner. However, I feel you get a better flavor and texture out of the onions and bell peppers if you sauté them in butter for a couple minutes first. 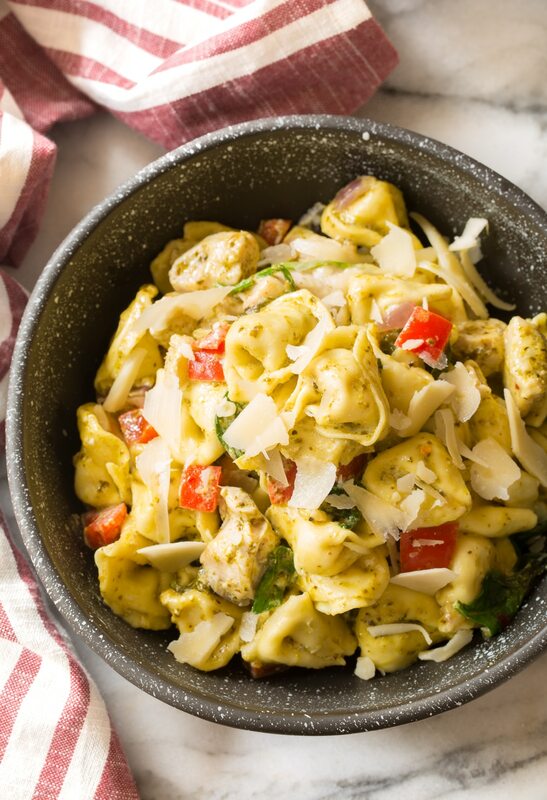 When the Pesto Chicken Baked Tortellini is half way through cooking, sprinkle the top with fontina and parmesan cheese for a decadent molten finish! 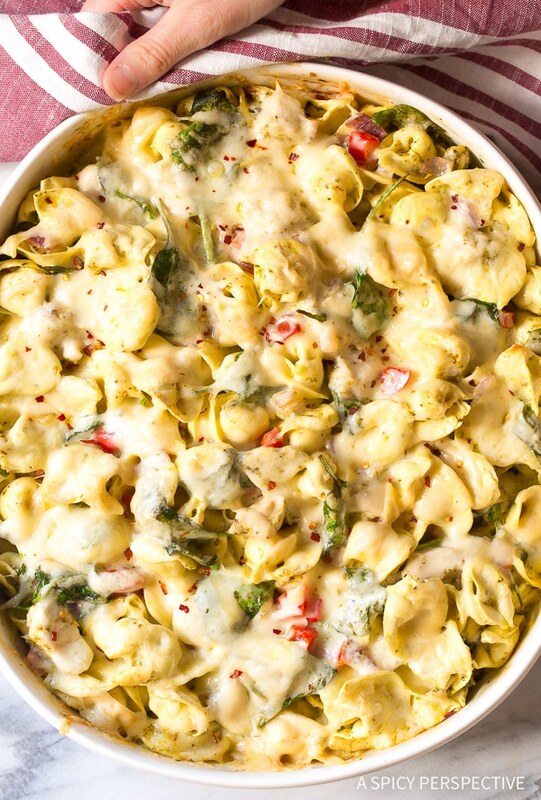 This all-season Pesto Chicken Baked Tortellini feeds a large group. Serve it this weekend with a light summery salad and a bottle, or two, of white wine. 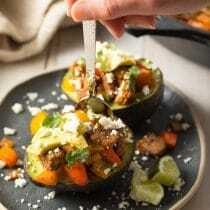 It’s an easy dinner your friends will rave about! 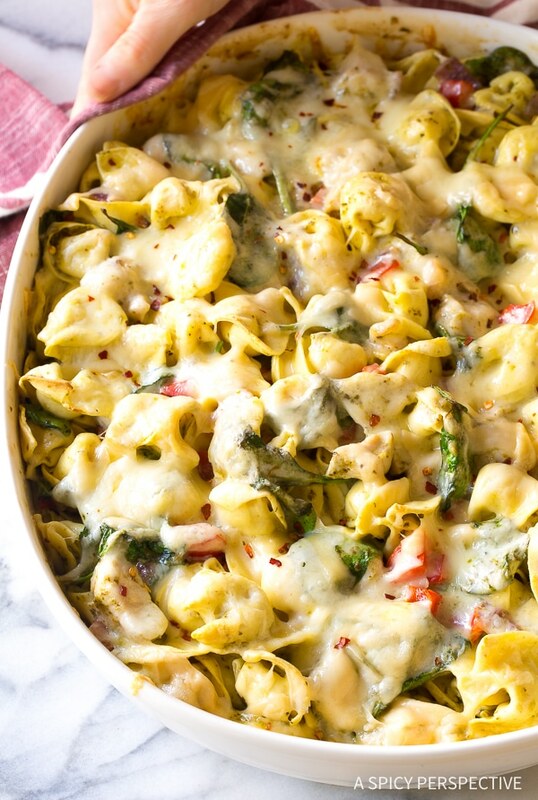 Creamy Pesto Chicken Baked Tortellini Recipe, a simple zesty baked pesto chicken pasta with cheese tortellini, fresh spinach, and peppers. 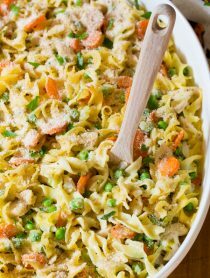 Preheat the oven to 400 degrees F. Place the butter in a medium-sized skillet and set on the stovetop over medium heat. Add the onions and sauté for 2 minutes. Then stir in the chopped red pepper and sauté another 2 minutes. Turn off the heat. 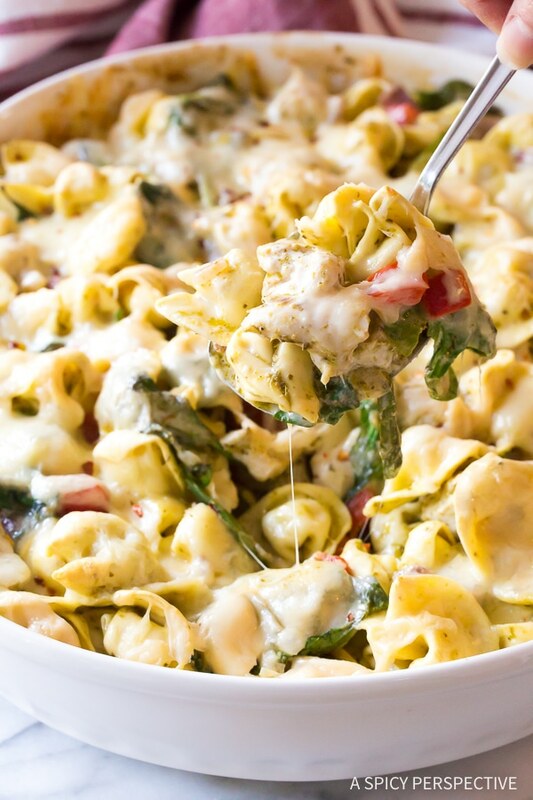 Pour the tortellini in a large 3-quart (9x13-inch) baking dish. 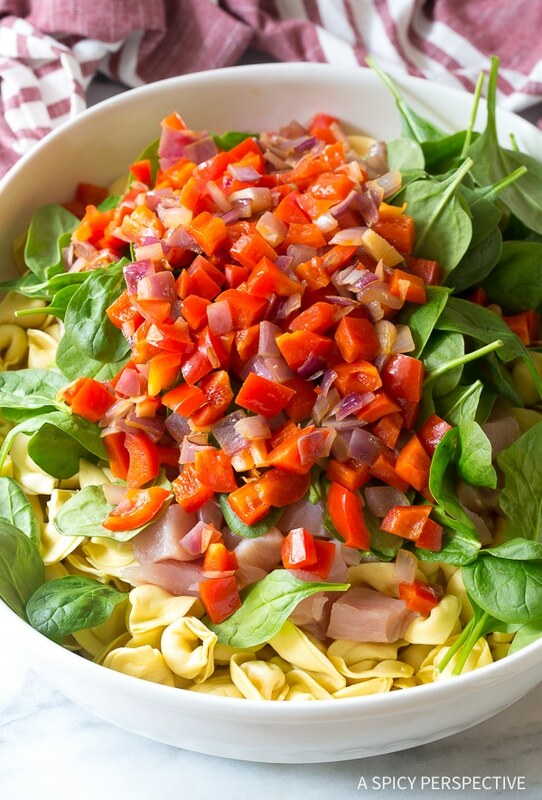 Place the chopped chicken, fresh spinach, and sautéed onions and peppers in the dish. Toss to mix evenly and spread out in the pan. Mix the pesto, chicken broth, heavy cream, 1 teaspoon salt, and 1/2 teaspoon ground black pepper in a bowl or measuring pitcher. Whisk well, then pour the mixture over the tortellini. 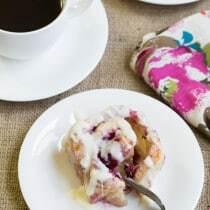 Cover the pan with foil and bake for 20 minutes. Then gently stir the pasta to make sure the tortellini on top is covered in sauce. Sprinkle the top with both cheeses and bake, uncovered, for another 15-20 minutes. Serve warm. NOTE: 1. 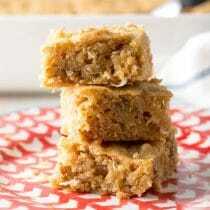 This recipe can easily be halved and baked in an 8- or 9-inch square pan for a smaller batch. 2. You can add the onions and peppers to the baking dish raw for a true one-pan recipe, but I feel sautéing them first improves the flavor and texture. Is the chicken cooked before putting it in the casserole? 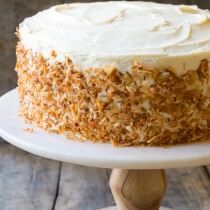 If I make this but split between 2 8-inch pans, can I freeze one just the way it is? And what would the cooking time be for an 8 inch pan? Pasta is out of season in the summer?! Step away from people like that. — you don’t need that negativity in your life…LOL!